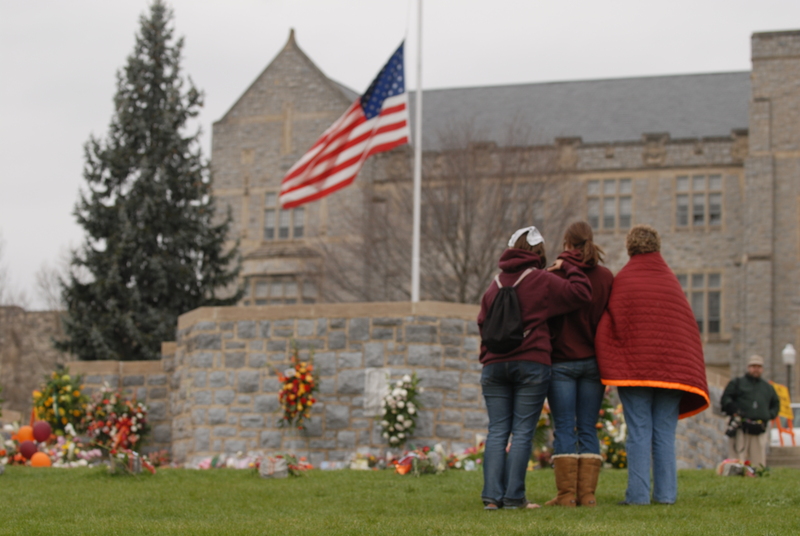 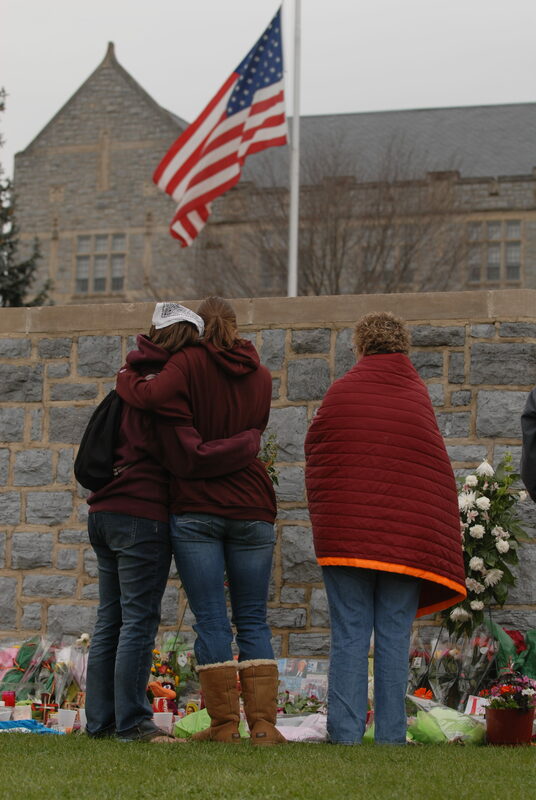 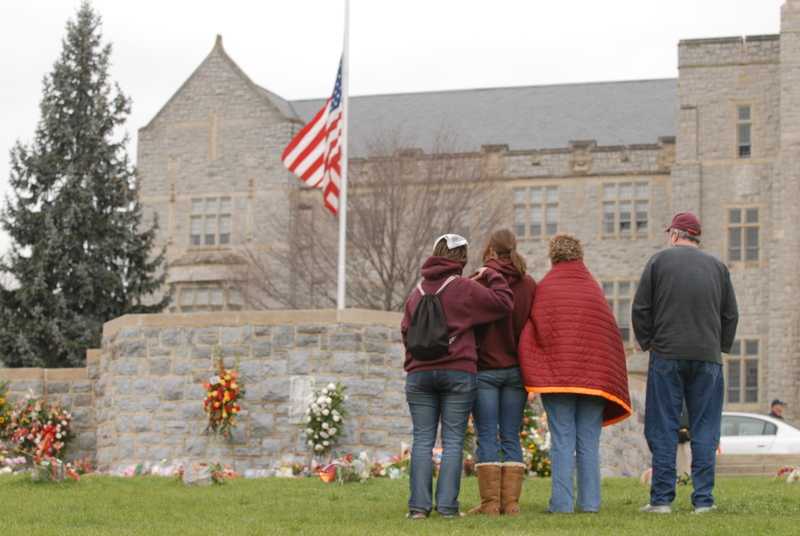 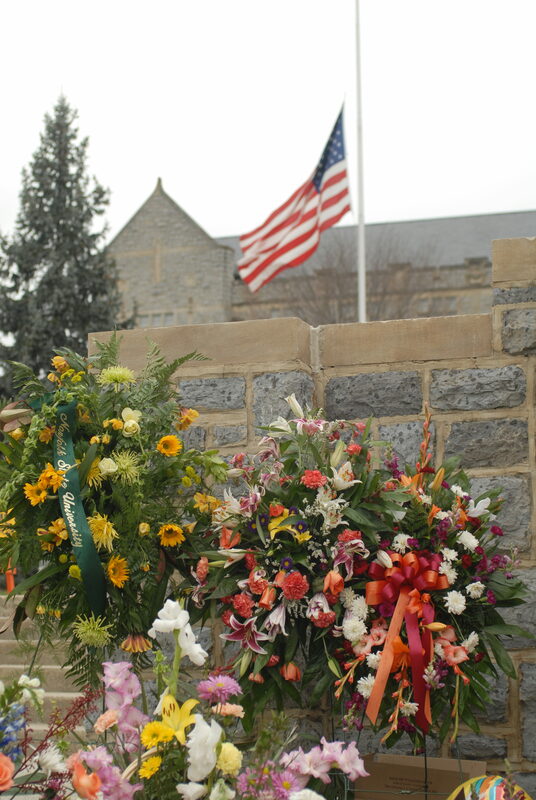 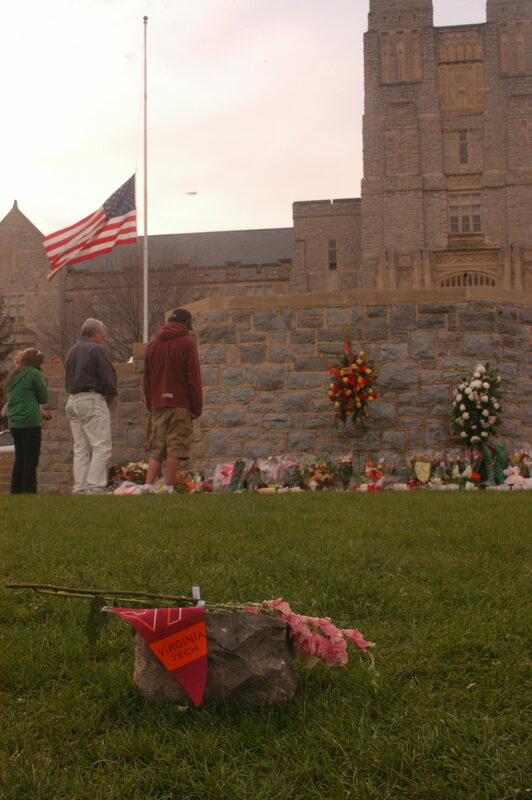 Flowers and Tech flags rest on Hokie stones that had been laid out for the 32 victims of the April 16 shooting, April 18, 2007. 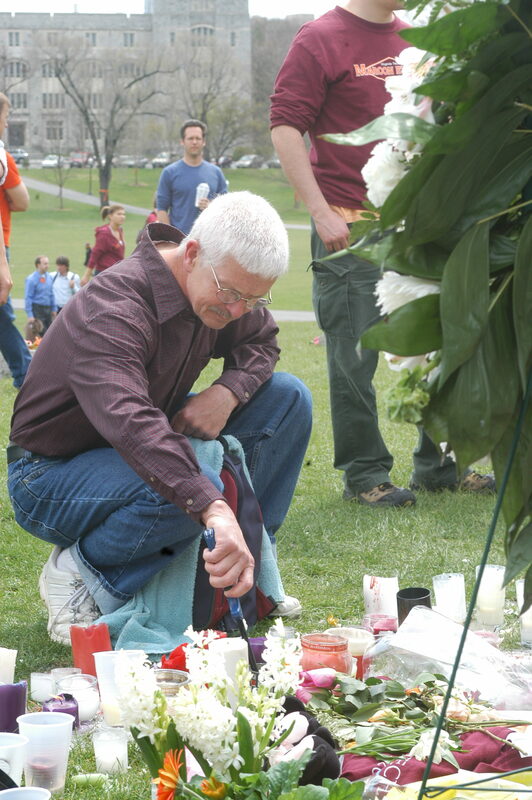 A man lights a candle in memory of the 32 victims of the April 16 shooting, April 19, 2007. 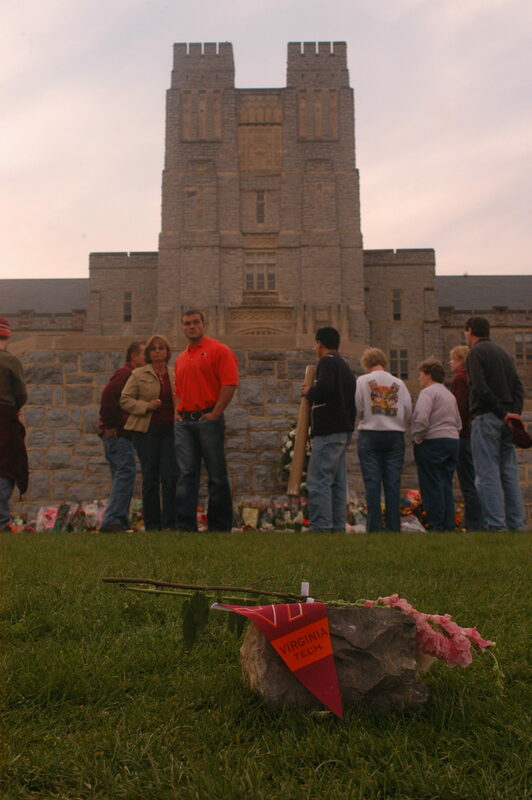 Thirty-two pieces of Hokie stone were placed on the Drillfiend outside of Burruss Hall in memorial of the victims of the April 16 shooting, April 19, 2007. 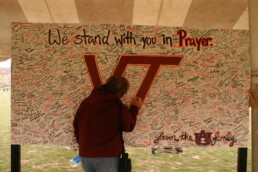 Students and community members sign a board from Auburn University, April 18, 2007. These boards are now on display in Squires Student Center. 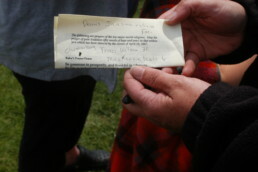 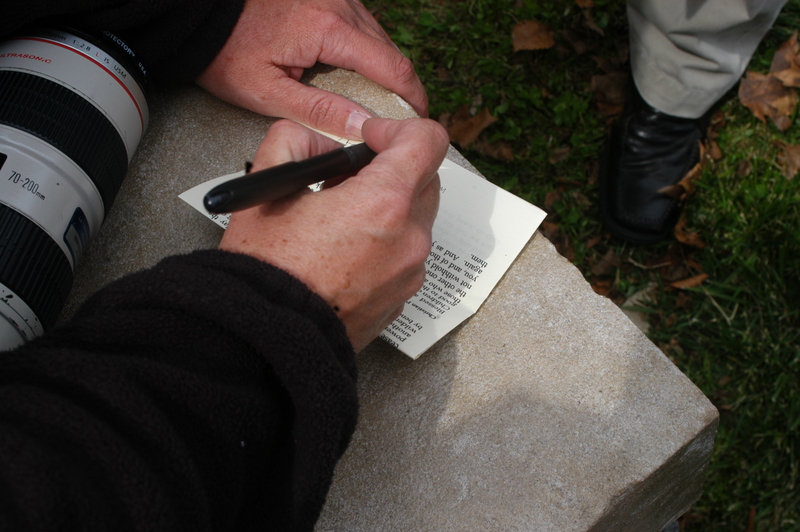 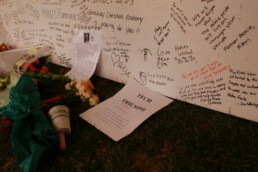 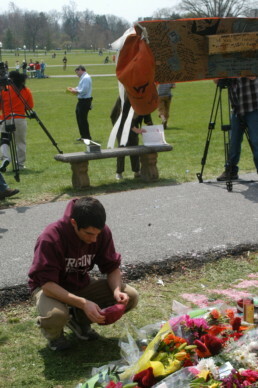 A student writes his name on a prayer to leave on a memorial of a victim of the April 16 shooting, April 19, 2007. 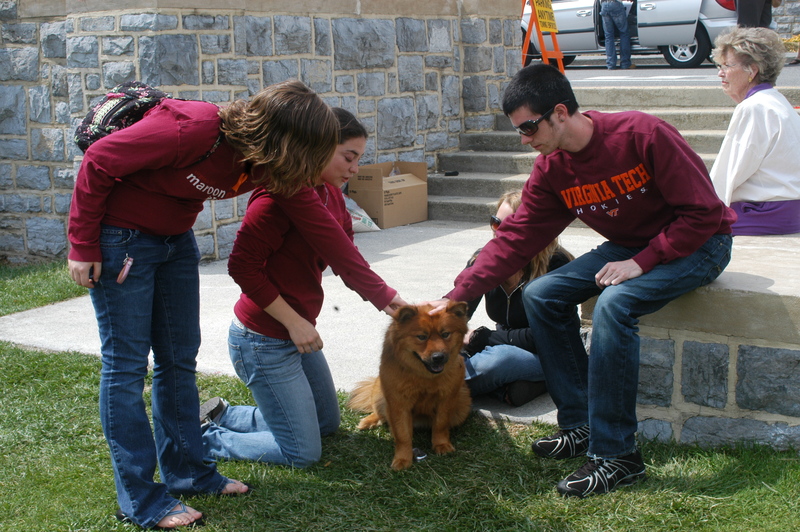 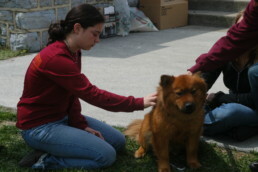 Students brought animals to the memorials to help those in mourning after the April 16 shooting, April 19, 2007. Students and community members left prayers for the 32 victims of the April 16 shooting, April 19, 2007. 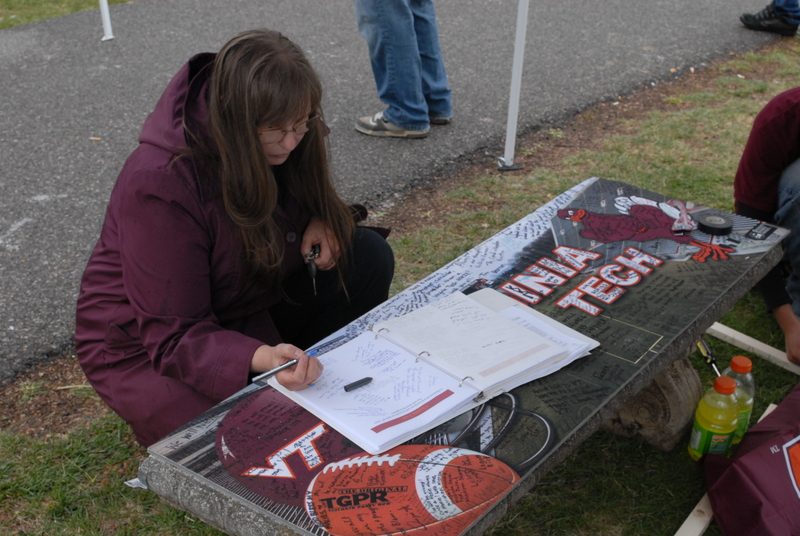 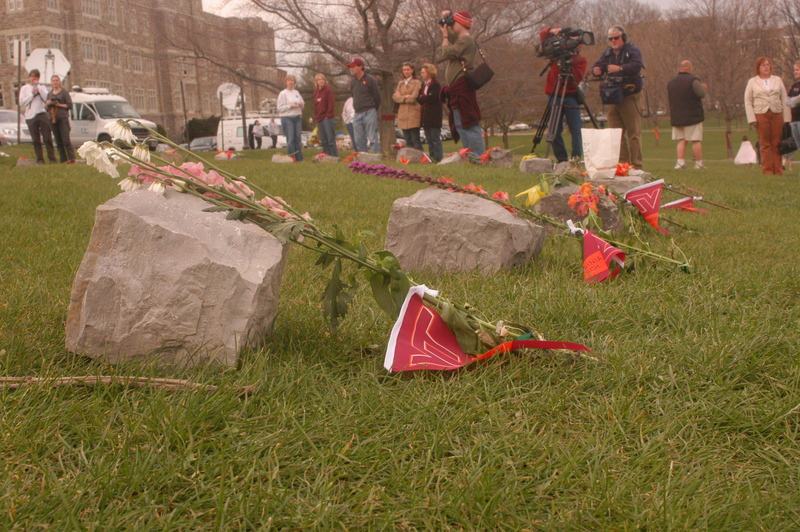 Thirty-two pieces of Hokie stone were spread out on the Drillfield for each of the victims of the April 16 shooting, April 18, 2007. This temporary memorial was later turned into a permanent part of campus. A candle is placed in front of Burruss Hall on the Drillfield in memorial of the victims of the April 16 shooting, April 18, 2007. 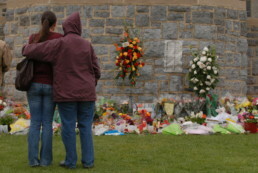 A family watches over the April 16 memorial just days after the shooting, April 19, 2007. 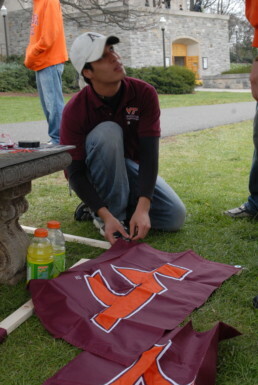 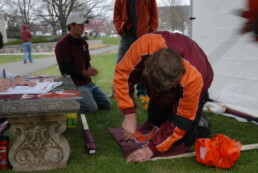 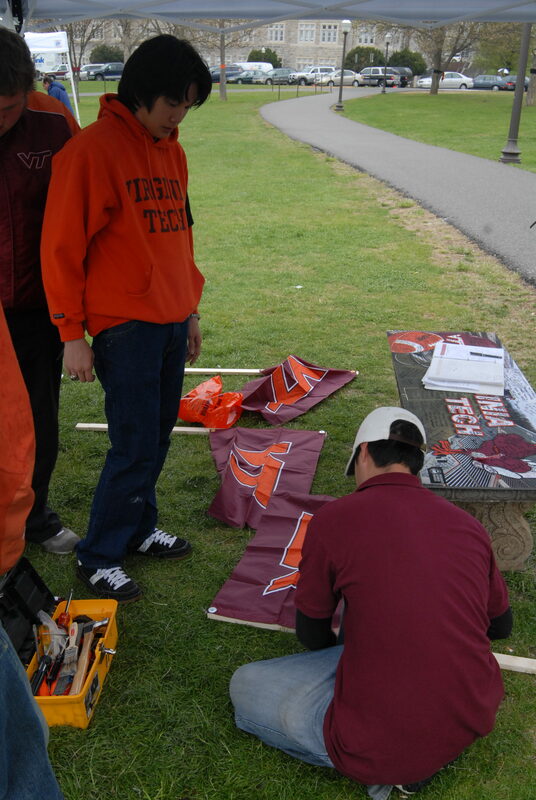 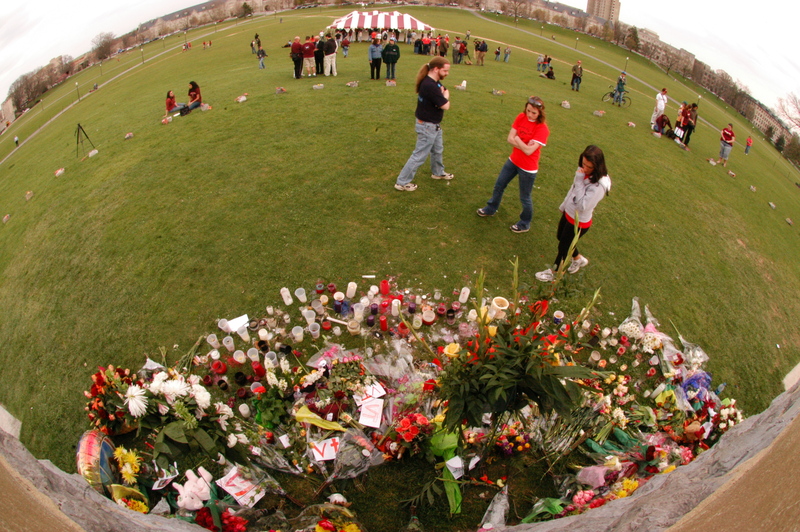 Students prepare temporary memorials for the Drillfield in memory of the 32 lost, April 19, 2007. 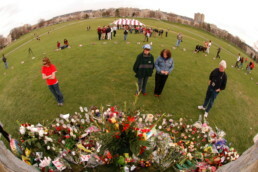 Community members write messages in remembrance of the 32 victims of the April 16 shooting on temporary memorials on the Drillfield, April 19, 2007. 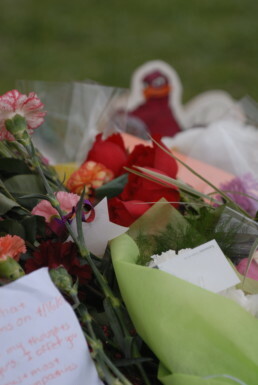 Students and community members left flowers and prayers next to a memorial board after the April 16 shooting, April 18, 2007. 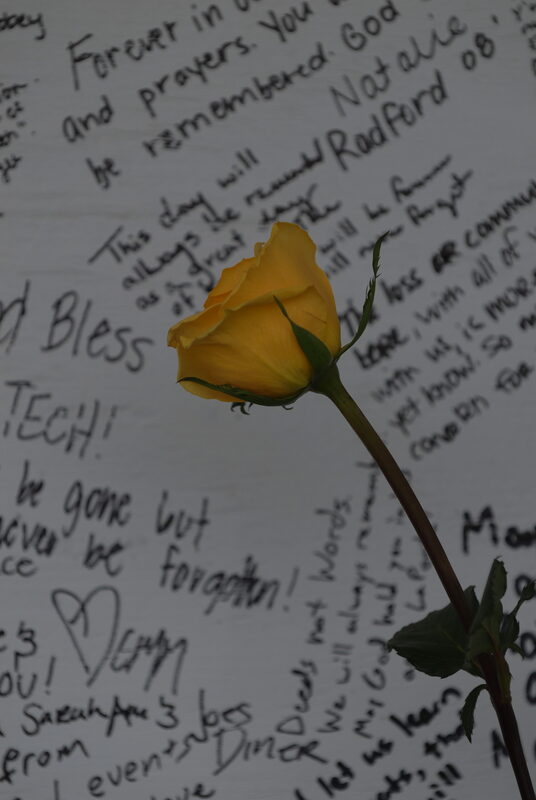 A yellow rose sits on top of a board filled with messages of love for the 32 victims of the April 16 shooting, April 18, 2007. Students and community members sign a memorial board, April 18, 2007. 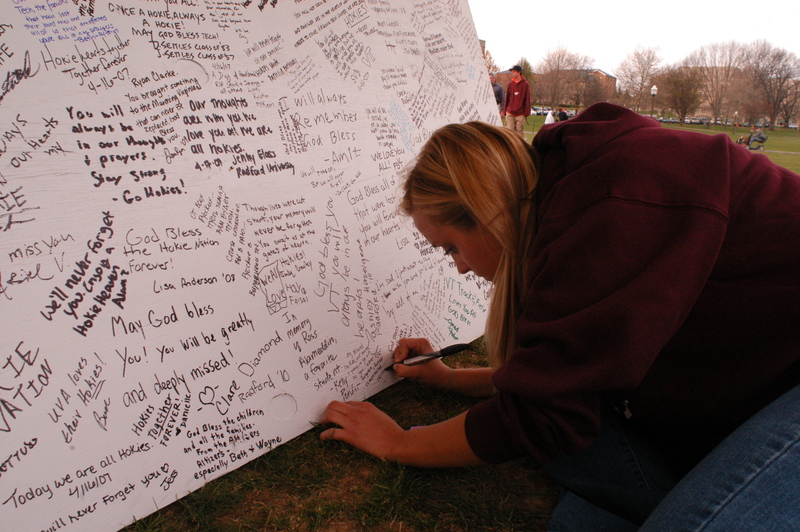 These boards are now on display in Squires Student Center. A student mourns by a temporary memorial that was built on the Drillfield after the April 16 shooting, April 19, 2007. 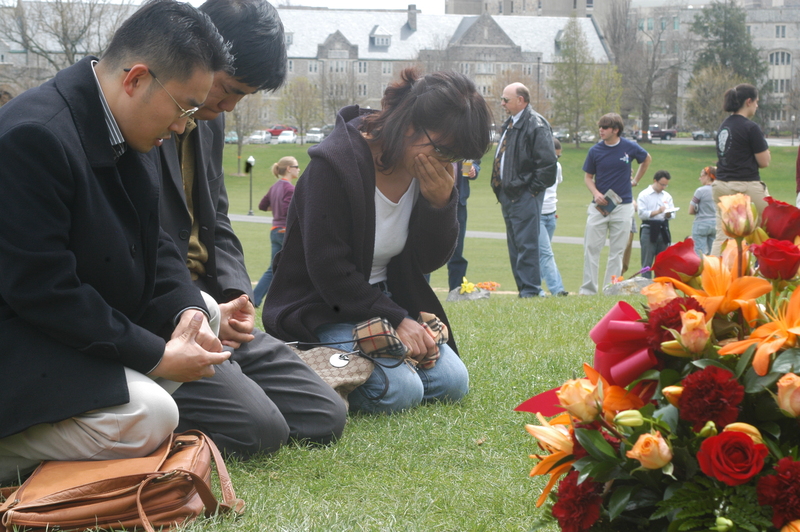 A family kneels on the Drillfied as they mourn the 32 victims of the April 16 tragedy, April 19, 2007. 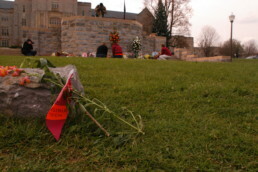 Flowers left at the base of Burruss Hall to mourn the 32 who were lost on April 16, 2007. Roses lay next to a board filled with messages of love for the 32 victims of the April 16 shooting, April 18, 2007. 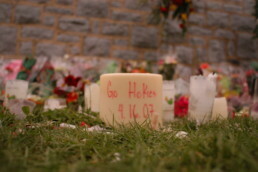 Students and community members left flowers and messages on temporary memorials following the April 16 shooting, April 19, 2007. 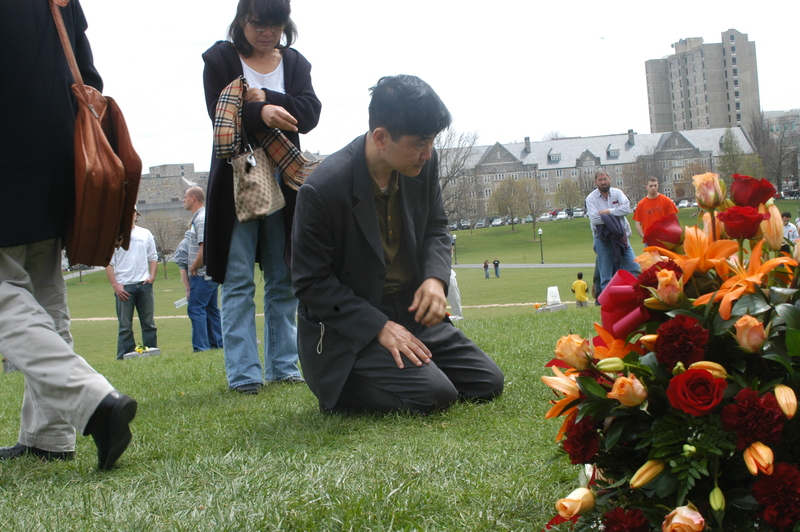 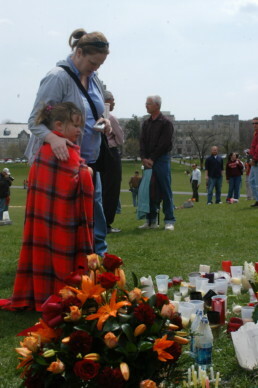 A family stands above a temporary memorial placed on the Drillfield after the April 16 shooting, April 19, 2007. Students and community members signed prayers and left them on memorials of the victims of the April 16 shooting, April 19, 2007. 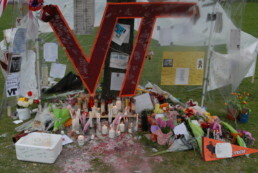 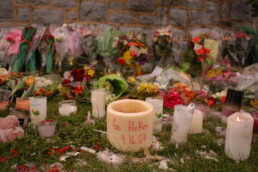 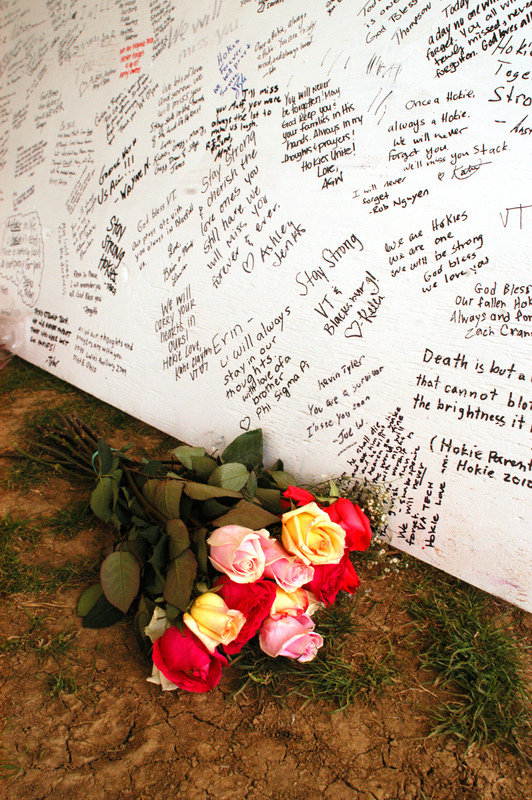 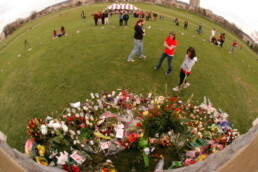 A temporary memorial was built on the Drillfield allowing mourners to add flowers, candles and messages, April 19, 2007. 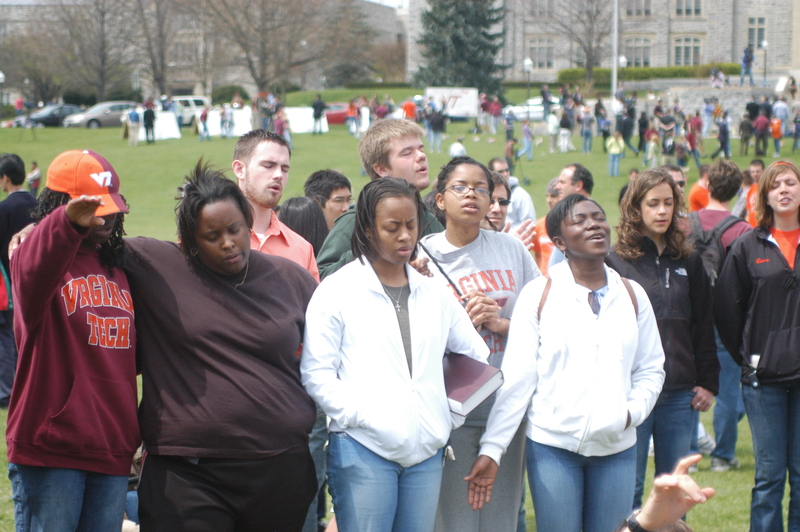 Students sing on the Drillfield in memory of the community members lost in the April 16 shooting, April 19, 2007. 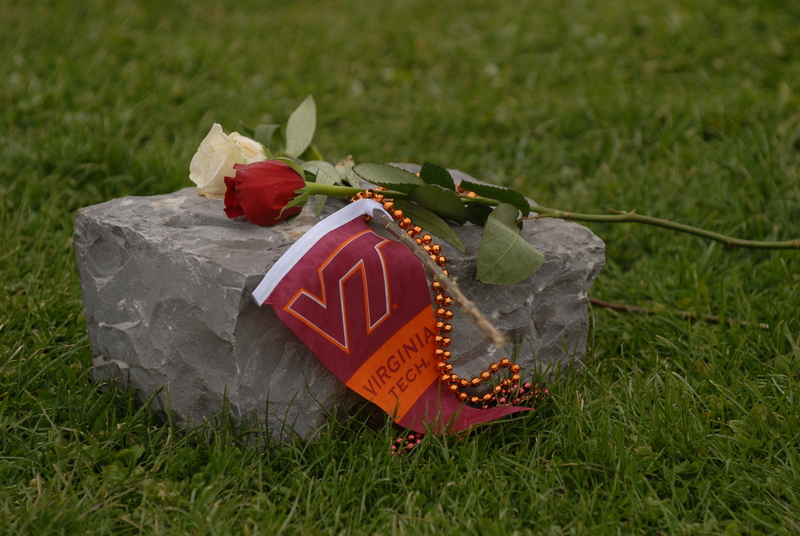 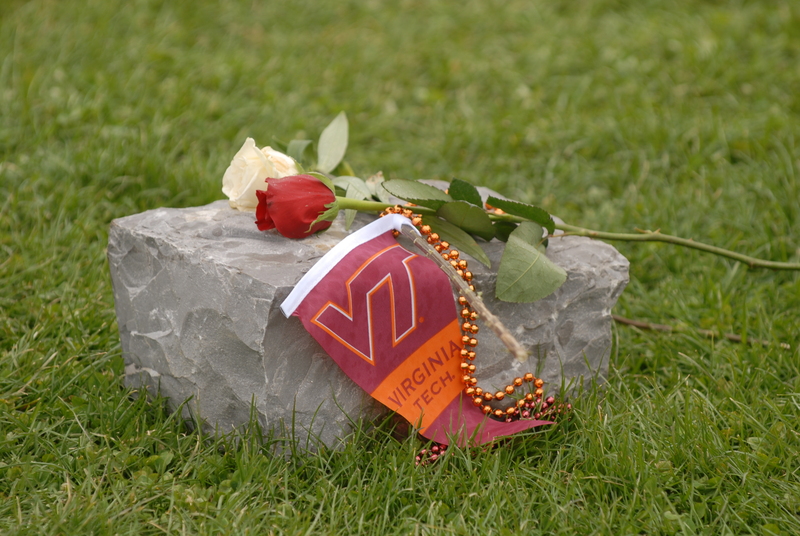 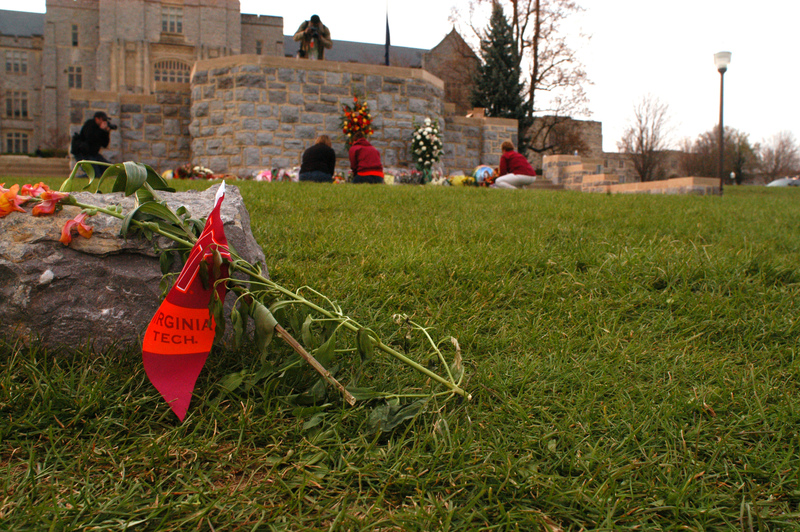 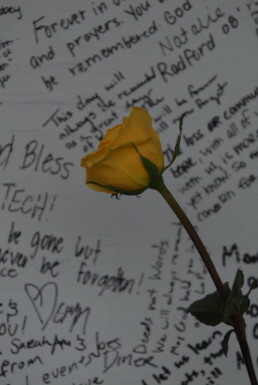 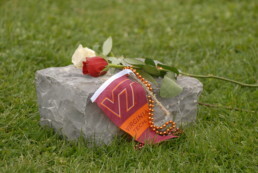 Flowers and a Tech flag rest on a Hokie stone that had been laid out for the 32 victims of the April 16 shooting, April 18, 2007. 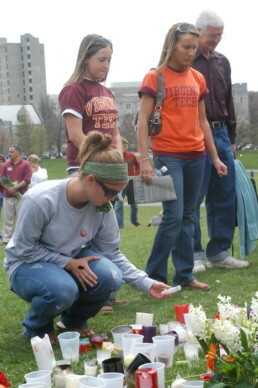 Students and community members mourn the 32 lost in the April 16 shooting at a memorial on the Drillfield, April 19, 2007. 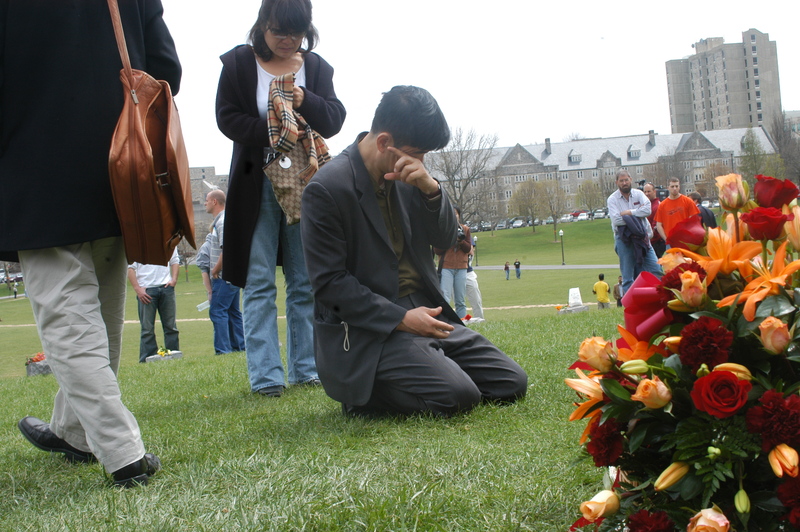 A man cries as he kneels by a memorial of a victim of the April 16 tragedy, April 19, 2007. 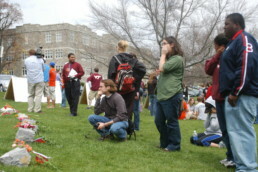 Students find comfort in their peers and community members as they mourn after the April 16 shooting, April 19, 2007. Students and community members stand by the temporary memorial built after the April 16 shooting on the Drillfield, April 19, 2007. 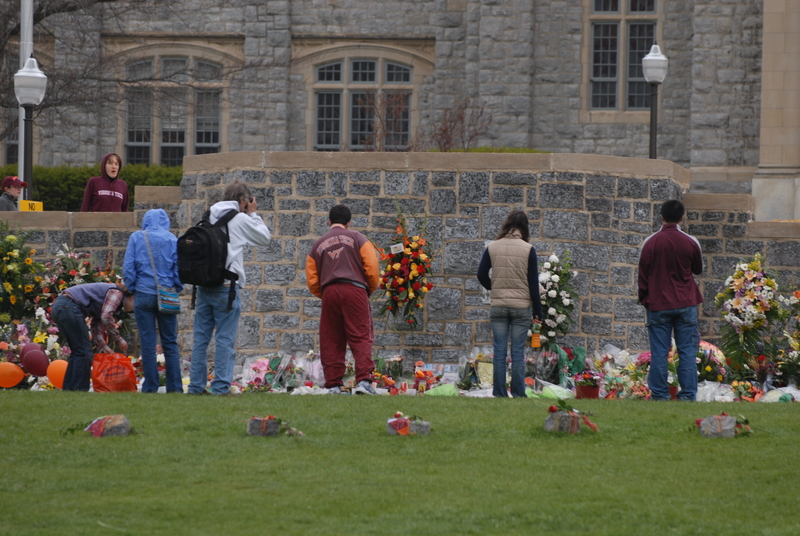 Wreaths of flowers placed around the memorial outside of Burruss Hall, April 19, 2007. A family leaves a basket of flowers in front of Burruss Hall in memory of one of the 32 victims of the April 16 shooting, April 19, 2007. 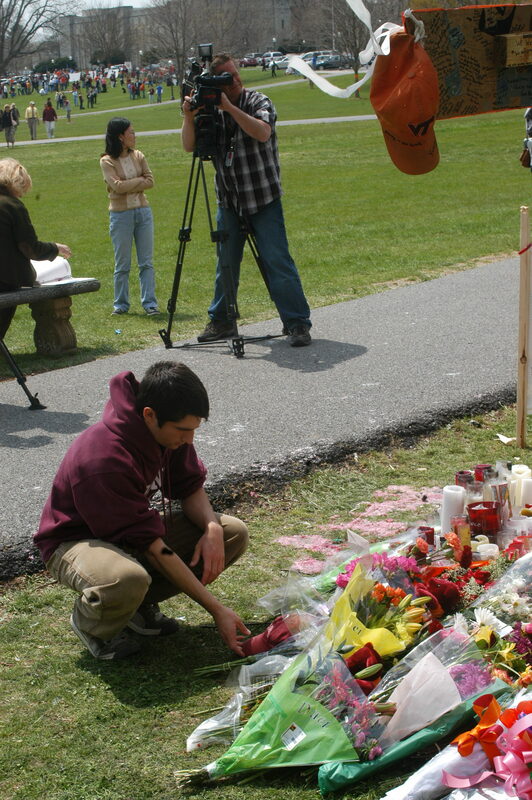 A student lays flowers at a temporary memorial after the April 16 shooting, April 19, 2007. 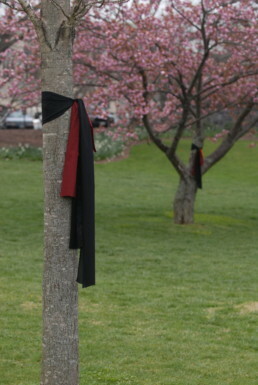 Black and maroon fabric was tied to the trees along the Drillfield in memory of the 32 victims of the April 16 tragedy, April 19, 2007. 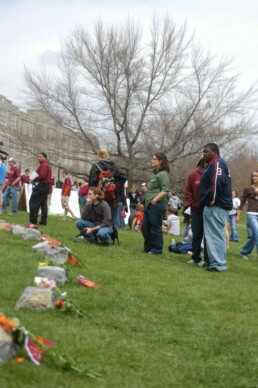 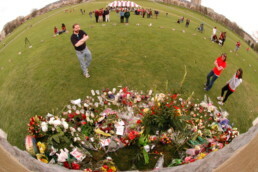 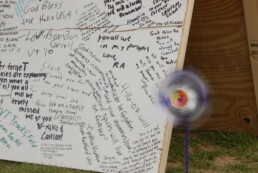 Students and community members visit a temporary memorial that was set up on the Drillfield after the April 16 shooting, April 19, 2007. 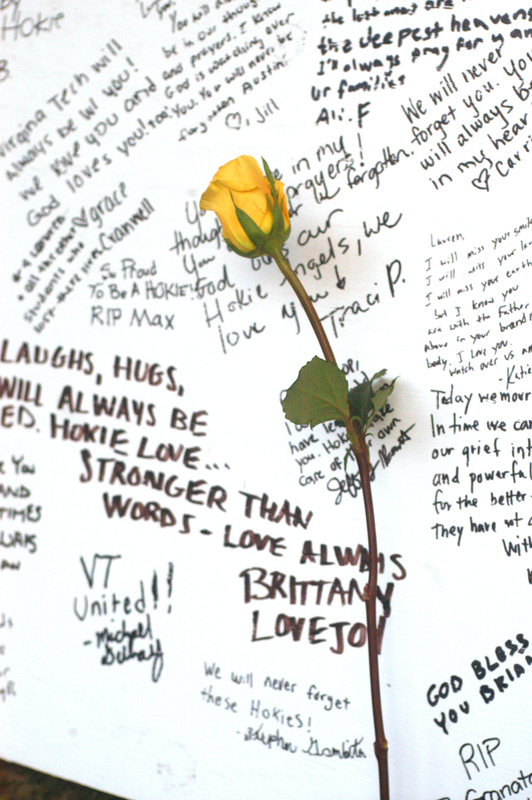 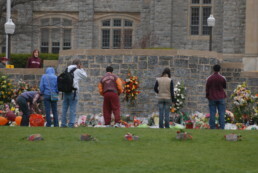 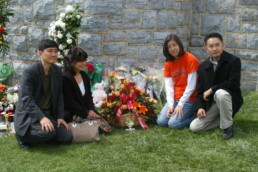 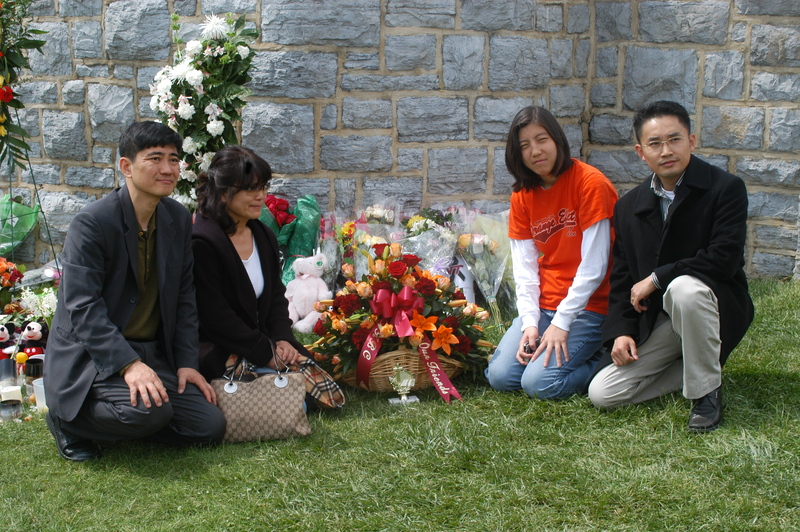 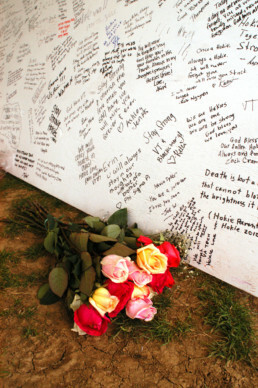 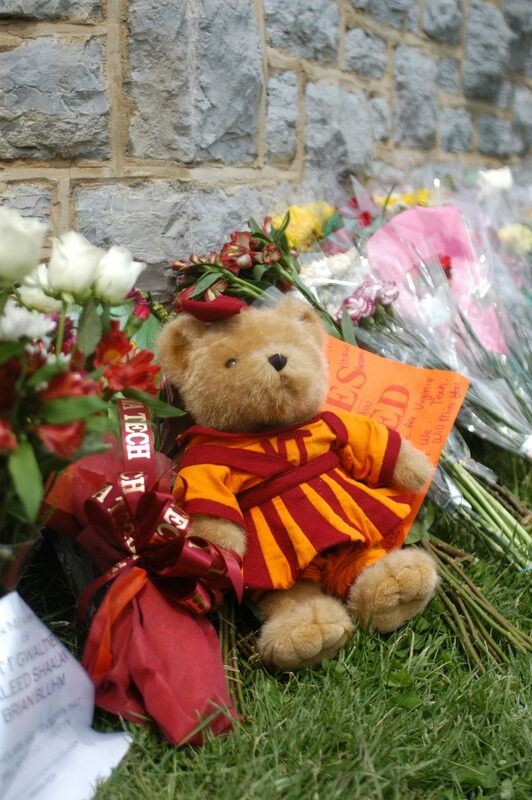 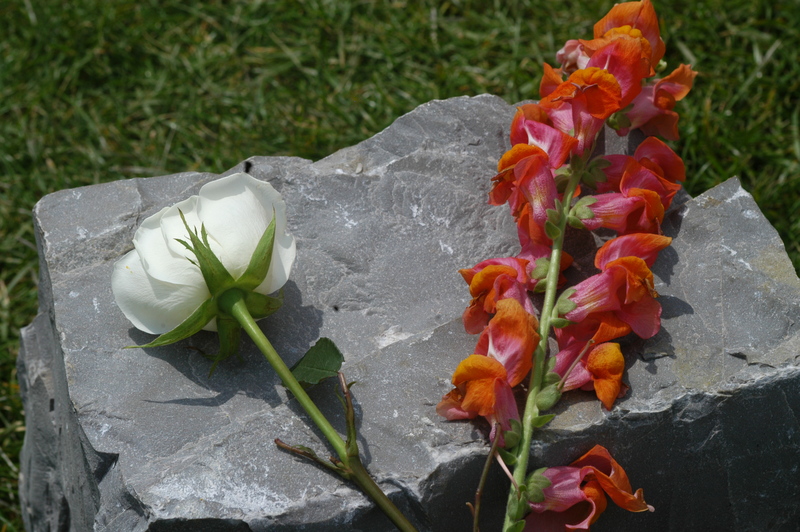 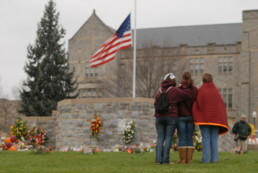 Flowers and 32 pieces of hokie stone were placed around the Drillfield outside of Burruss Hall in memorial of the victims of the April 16 shooting, April 19, 2007. 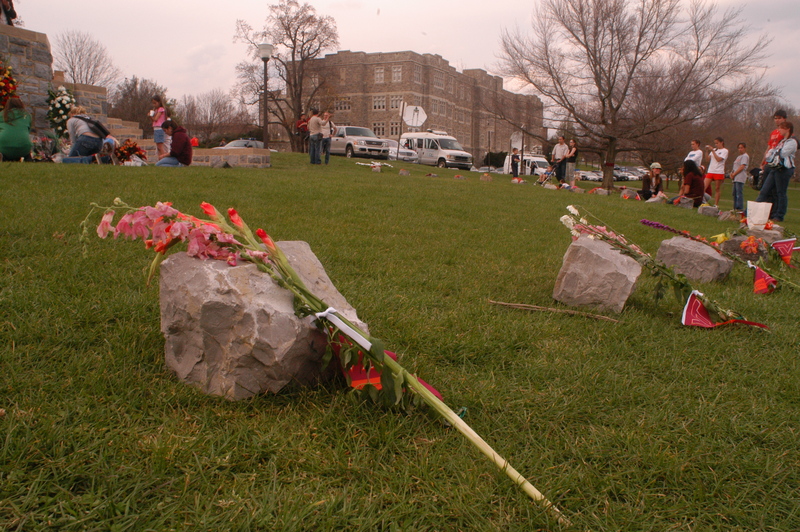 Flowers were placed on each of the Hokie stones outside of Burruss Hall in memory of the victims of the April 16 shooting, April 18, 2007. 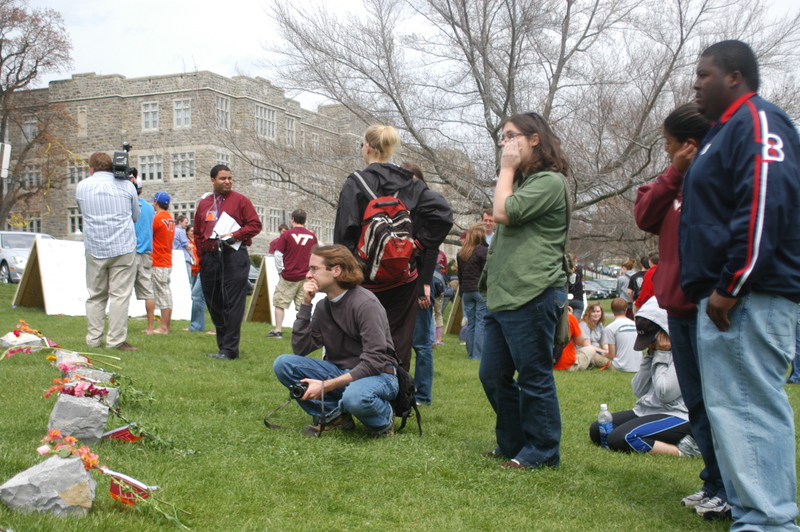 Students and community members gather around the temporary memorial that was built along the Drillfield after the April 16 shooting, April 19, 2007. 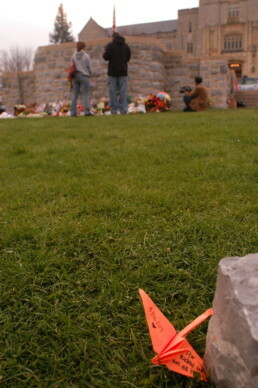 A paper crane is placed next to one of the Hokie stones in memorial of the victims of the April 16 shooting, April 18, 2007. 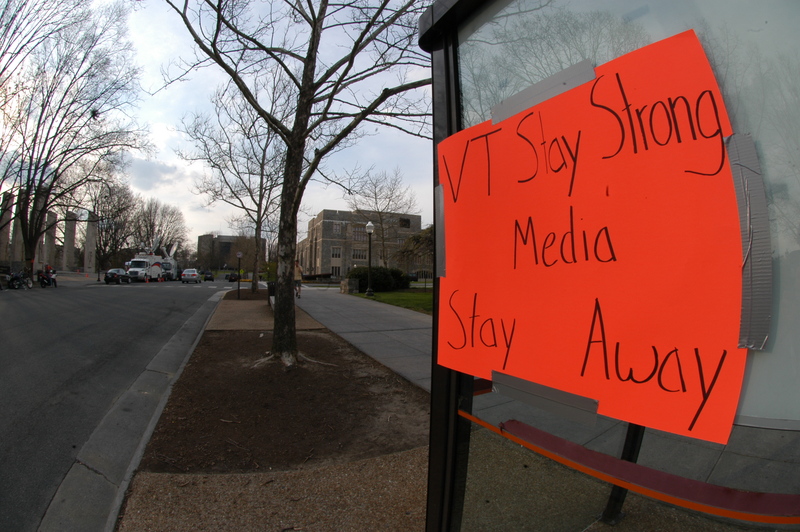 Written on the crane says "For today, we are all Hokies." 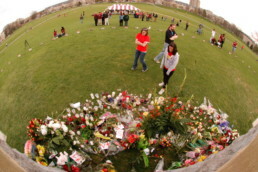 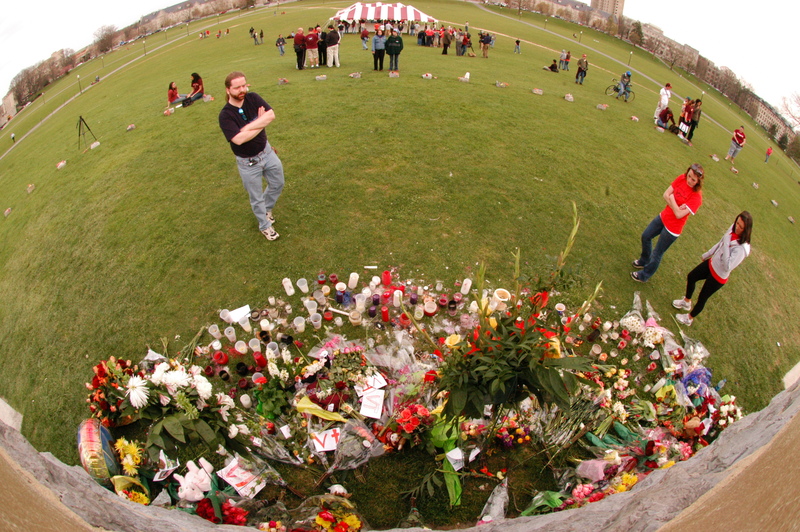 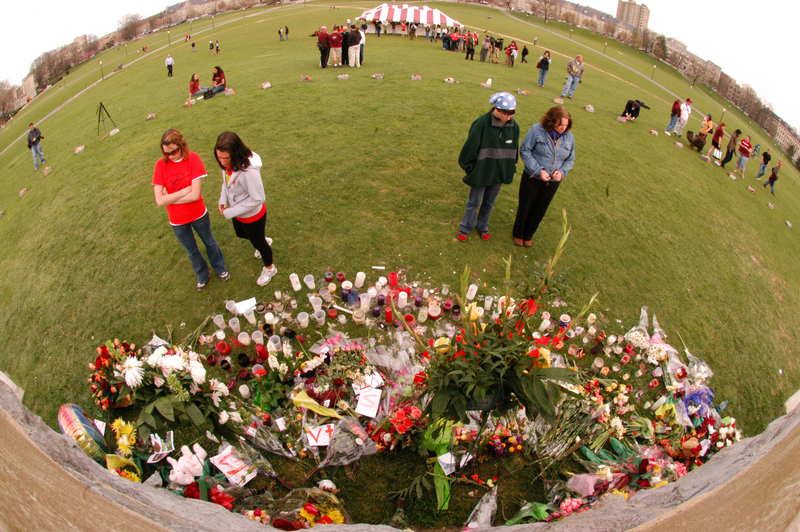 Flowers and gifts were left around the Drillfield in memory of the 32 victims of the April 16 shooting, April 19, 2007. 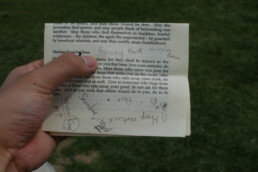 Community members write their names on prayers and leave them on the Drillfield after the April 16 shooting, April 19, 2007.